Kayaking the great fresh water ocean we call Great Bear Lake can be enjoyed either guided or unguided in tandem or single sea kayaks with seven day trips either basing from Arctic Circle or from Branson’s outpost or by travelling from either Arctic Circle to Branson’s or vice versa over the course of the week and camping in the field along the way. We provide the boats, paddles, tents, stoves, and cooking kits. You need to bring your paddling PFD’s, sleeping pads and bags with you. This is an incredible opportunity to paddle a body of water that is so rarely seen with plenty of wildlife to see and artifacts to discover. As you paddle the Carribean blue water amongst the islands and channels that make up the rugged shield spanning the back of the McTavish Arm you will pass by history of mankind in the site of Port Radium where silver, gold and radium were discovered in 1930 and where the nuclear material for the Manhattan project was mined. We recommend some pleasure reading including some historical tales of the explorers of the area be read before your trip and one or two books brought with you as they are sure to conjure goose bumps around the fire in the evenings. Prices: Your seven day Kayaking adventure includes everything you will need as well as meals and accommodations at the start and end points and camping along the way. You must bring your own sleeping bag and pad. 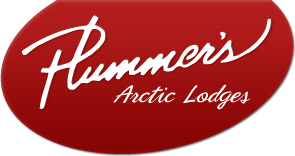 Air charter to and from Yellowknife is included. Prices exclude fishing license, liquor, gratuities and tax (5%). 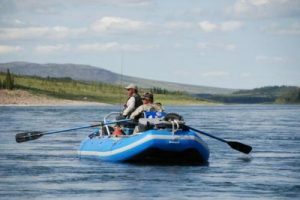 Rafting the rivers of the Arctic including the Coppermine is a serene and spectacular way to see the Arctic and to fish for char, hike the tundra and explore. 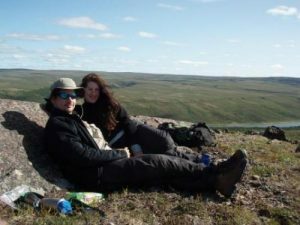 There are too many options to list but the adventures that you can embark on include anything from a few days floating a river during a one week stay at Great Bear Lake to a couple of weeks covering 200 kms of river and everything in between. We can even provide some of the equipment for camping riverside other than sleeping pads and bags. We also encourage you to bring your own properly fitted PFD but we can provide them for you as well. We fly two rafts into the field per trip. Each raft holds up to three people. Pricing for rafting trips vary depending on so many options that we recommend you contact us to discuss by telephone or email. Like kayaking and rafting, we can outfit canoe trips from our lodges. We have 16, 17, and 18 foot prospector ABS boats and can drop you where you want to begin and pick you up where you want to finish. So the first part of the fun is opening your map of the north, putting it on the dart board and start the planning! The limitless options are really up to your sense of adventure. Contact us to arrange these trips.